Have you taken a mum's day out recently? With the demands of motherhood, it is easy to get caught up with family and kids, and completely forget to take time out to recharge. We all need a little time to ourselves, to relax and do what we love, so that we can face each moment with a fresh new outlook. 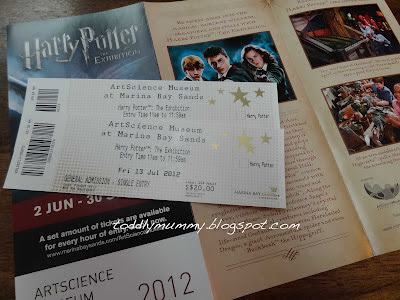 Last Friday was mum's day out for me, and I went to the Harry Potter: The Exhibition at the ArtScience Museum. 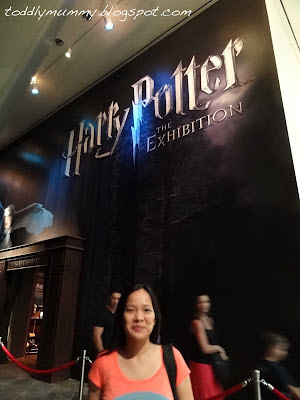 As a big fan of the nemesis of He-Who-Shall-Not-Be-Named, I was accompanied by a huge fan, my sister, the best company because, as she describes herself, she knows all the books inside out, up and down, from front to back. No photography was allowed inside the exhibition, so I took the opportunity to take any possible photos anywhere. I even took photos of the tickets prior entry. 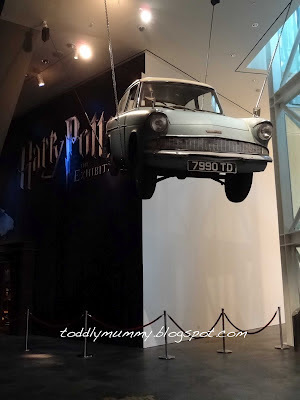 ... And of course, the Flying Ford Anglia. 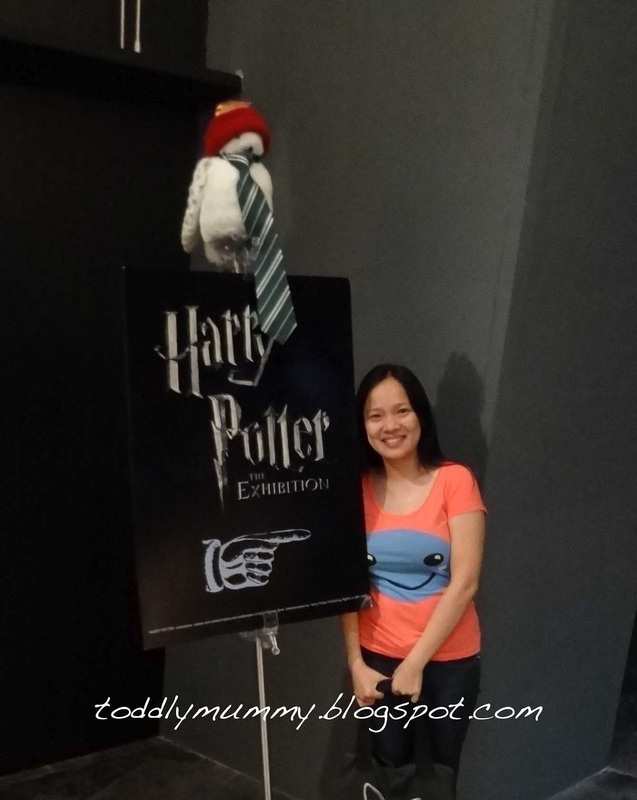 Before entering the hall, we could take a photo at the official photo booth, while wearing a scarf. There were two to choose from - Gryffindor (scarlet and gold) or Ravenclaw (blue and bronze). Both of us chose Gryffindor, of course! The exhibition covered all the main characters and scenes of the movie, with dedicated areas for the Dark Arts, Forbidden Forest and Hogwarts School's Great Hall. There was even Hagrid's hut on display, complete with 'screaming' mandrakes that you can pull up from their pots. For the uninitiated, a mandrake is a plant with a root that looks like a human and screams whenever it is unearthed. The scream of a mature mandrake can kill, while that of a young mandrake will only knock one unconscious. We even tossed a Quaffle in the Quidditch area. We almost wished this game was real. Huge and big fans will go through the whole exhibition, reading every single comment and admiring every single costume or artifact on display. That took us about one and a half hours. Thank goodness I didn't bring the kids, otherwise, I wouldn't have had the luxury of time. Neither of them would understand or appreciate anyway. A not-so-big fan will zoom through it and be done in probably half an hour. Practical me got myself things that I could either use or eat, as well as one item that could be displayed. 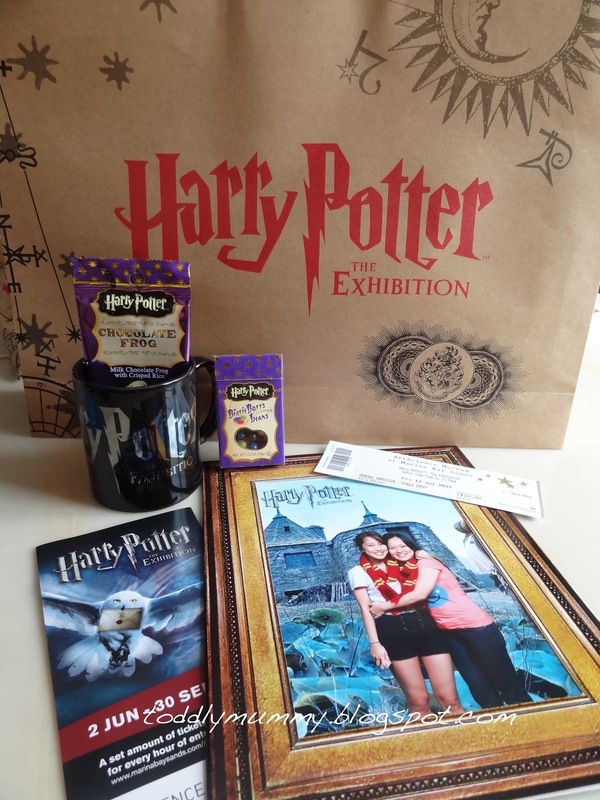 I got a mug ($20), a Chocolate Frog ($5/6), a box of Bertie Bott's Every Flavour Beans ($5/6) and the photo taken earlier ($20). My sis got the Frog and the Beans, as well as a exhibition guide ($30) that included a limited edition print of Harry's Hogwarts acceptance letter. 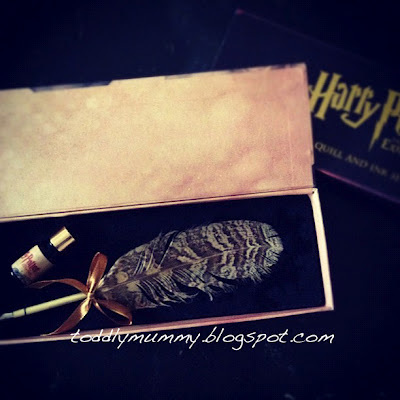 She even got herself a quill set ($65). 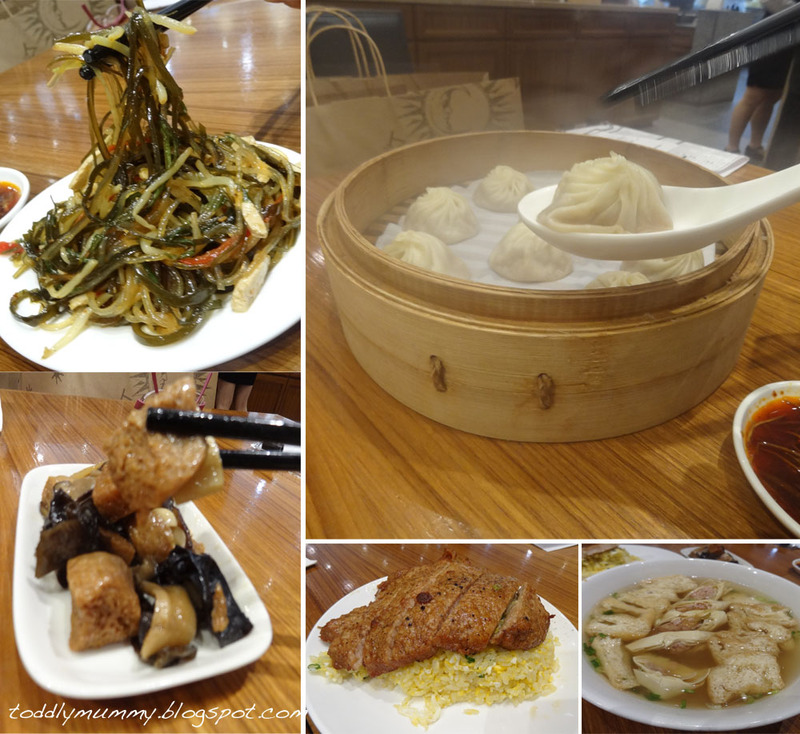 Mum met us after, and we had a very yummy lunch at Din Tai Fung. Love the food there. I truly enjoyed myself, thankful for those few hours away from the kids, and the chance to spend some quality time with mum and sis. 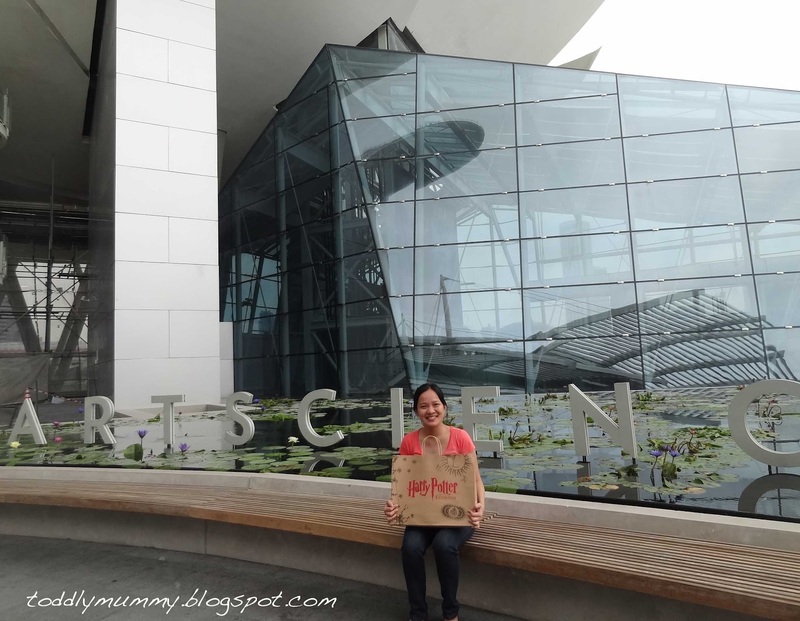 It's a mum's day out that felt so good, it was almost 'magical'.